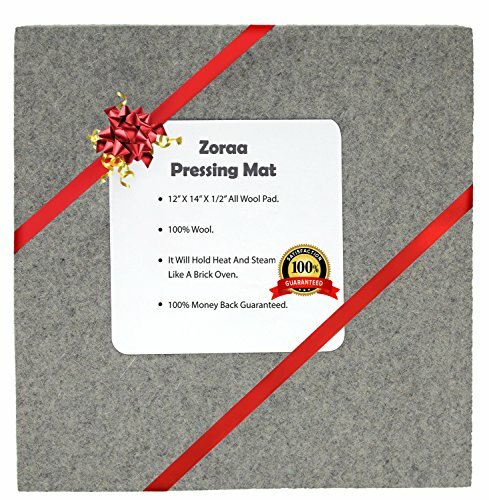 AVROZ LLC has created a high-end wool pressing mat that will eliminate stretching, providing you with professional perfection in your quilting, sewing or craft fabrics ironing. Get A Quilter's Pressing Mat That Stands Out! Whether you're looking for a tabletop ironing pad for home, the college or the workplace or a portable side-table ironing mat for sewing or embroidery, you've got it! Easily carried in your handbag, backpack or luggage, this quilt mat will ensure ironing perfection at home, in your travels and in your refreshing camping weekend. Easy to use, durable and with an excellent heat- holding capacity, it makes the #1 pressing surface for the professional quilter or the home DIY enthusiast. Offer it as an original gift on all occasions and put a wide smile on the face of the lucky recipient! PRO STANDARD IRONING WITH OR WITHOUT STEAM, with a premium quilting pressing mat made of 100% wool, with dense interlocking fibers preventing stretching & making your quilting ironing an easy, fast, most efficient task. PERFECT FOR SEWING, EMBROIDERY & DIY CRAFTS: Designed in the ideal shape for convenient ironing, this wool heat pressing mat makes your handy sewing iron pad for detailed sleeve or pant seams ironing, your embroidery mat or your DIY flat iron pad. AN EXCELLENT PORTABLE IRONING PAD: Compact, feather-like and easily fitting in your handbag or luggage, ZORAA mini iron pad will make your tabletop ironing pad in the hotel room, the college dorm and wherever you are. If you have any questions about this product by ZORAA LLC., contact us by completing and submitting the form below. If you are looking for a specif part number, please include it with your message.